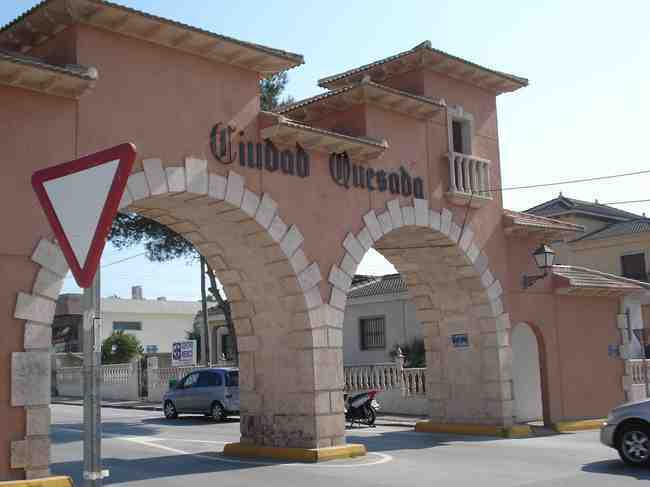 Ciudad Quesada accommodation situated on the Costa Blanca about 35 to 40 minutes drive south of Alicante. Ciudad Quesada is a wonderful place for a relaxing holiday and an attractive location for golfers. Quesada village itself offers a very good choice of restaurants, shops and banks, a pharmacy, medical centre and an excellent choice of bars. The nearest typically Spanish village of Rojales is just a five minute drive and has a large indoor market offering fresh fish, meat and vegetables. The larger coastal towns of Guardamar & Torrevieja are only 10/15 minutes by car. Here you can relax on wonderful sandy beaches or enjoy fabulous parades at fiesta times. Situated in Ciudad Quesada, this air-conditioned apartment features a terrace. The unit is 35 km from Alicante. There is a seating area, a dining area and a kitchen complete with an oven, a microwave and a toaster. Towels and bed linen are available in this self-catering accommodation. Other facilities at Buena Vista Golf include an outdoor pool. Murcia is 39 km from Buena Vista Golf, while Torrevieja is 12 km from the property. The nearest airport is Alicante Airport, 26 km from the property. Villa Rojales is a villa located in Ciudad Quesada, 38 km from Alicante. The air-conditioned unit is 37 km from Murcia. Free WiFi is offered throughout the property. A TV is featured. There is a full kitchen with a dishwasher and a microwave. Featuring a shower, shared bathrooms also come with a bath and a bath or shower. You can enjoy pool view from all the rooms. At Holiday home Scardroy Quesada you will find a garden and a terrace. The property offers free parking. This holiday home is 29 km from Alicante Airport. here are 3 bedrooms, one 15 m2 bedroom with 1 french bed, shower/WC, electric heating and air-conditioning; one 10 m2 bedroom with 2 beds, electric heating and air-conditioning and one 9 m2 room with 1 sofa bed (135 cm). The living/dining room has 20 m2 and an open fireplace, satellite-TV, international TV channels, video, stereo unit, DVD and electric heating. Note that 1 mobile Air Conditionning unit is avalailable. The open kitchen is equipped with an oven, dishwasher, micro wave and electric coffee machine. The house has a washing machine and a dryer. There are shops, grocers, supermarket, shopping centre, restaurant, bar, bakers and a café within 1 km. An internet café can be found 2 km away, a rent a bike is at 5.4 km. You can find the sandy beach “Moncayo-Guardamar” at 10 km distance. An 18 hole golf course is within 800 m.
All watersports (diving, sailing, surfing, sailing school, water skiing…) are available in Torrevieja y Guardamar 10 – 8 km. An 11km long Sandy beach with beach facilities, suitable for children, 8 km from the resort. Water park “Ciudad Quesada” and Sports harbour Guardamar in 7 km. Nearby attractions include: Torrevieja (15 km), Guardamar (10 km), Waterpark (3 km), Zoo Safari Elche (18 km). from Rental Spain information index Ciudad Quesada Accommodation. 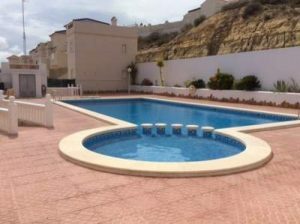 Casa Sara is a detached holiday home with a patio, situated in Ciudad Quesada in the Valencia Community Region. The holiday home comes with air conditioning and free WiFi. There is a seating area, a dining area and a kitchen equipped with a dishwasher. Towels and bed linen are available in this self-catering accommodation. There is a private bathroom with a hot tub, bath and bidet. Alicante is 36 km from Casa Sara, while Murcia is 39 km from the property. The nearest airport is Alicante Airport, 27 km from the property. This property has been on Booking.com since 22 Nov 2015. 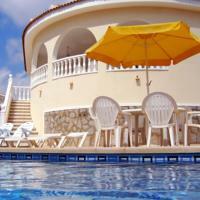 On the Costa Blanca Spain Quesada Accommodation. Located in Rojales, Golf Bungalow Pino Grande Rojales offers an outdoor pool. Accommodation will provide you with a TV, air conditioning and a balcony. There is a full kitchen with an oven and a refrigerator. Featuring a shower, private bathrooms also come with a bath and a bath or shower. You can enjoy garden view. At Golf Bungalow Pino Grande Rojales you will find a garden and a terrace. Activities in the surrounding area include golfing, hiking and diving. The property offers free parking. The World Health Organisation (WHO) considers this part of Spain, with the mildness of climate and low levels of humidity, to be one of the healthiest climates on the planet. With an average winter temperature of 15ºC, 320 days of sunshine and annual summer temperatues of 21ºC, Ciudad Quesada is an ideal destination anytime during the year. The lakes are also home to a host of wildlife including large flocks of Flamingos. Laguna de la Mata is now a Conservation Area with many paths and tracks around the lake, perfect for long walks or a mountain bike ride to take you away from it all, and yet a few moments from the town centre. from Quesada Accommodation Rental Spain information index Ciudad Quesada. Costa Blanca Quesada Pony and Traps. Quesada Pony and Traps on A Sunny morning in January on The Costa Blanca. Spain info also lists the Local Hot Water Spas many of them dating back to Roman times. Quesada Accommodation.